Today was National Cereal Day 2017. 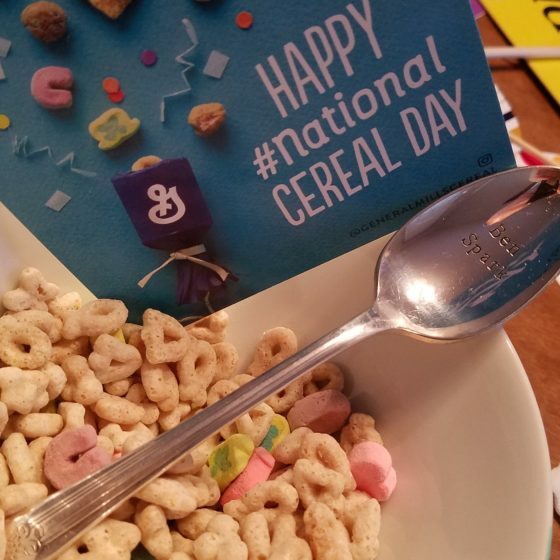 General Mills Cereals sent me a care package for celebrating National Cereal Day. In it was a box of Golden Grahams, some items for taking selfies and more photos as well as decorations. I made a couple of things for the family. I made some Golden Grahams S’mores and some Lucky Charms Pancakes. I mixed up the mixture last night to actually make waffles but today was also national pancake day so I changed my mind this morning. Last night I also made up the Golden Grahams S’mores and they were very easy to make. Today was also the day that I received my Nintendo Switch. I tried making an unboxing video and it was okay. It was hard to video something that has such a shiny screen. I was able to play a little of The Legend of Zelda as well as some of Skylanders Imaginators. I’ve got many ideas for future videos to make, now I have to figure out the best way to do it. Here is my unboxing video.